Featuring an industrial-grade axial pump, an efficient burner, complete machine shut-down at the gun, low fuel shut-off, low water protection, high-temperature protection, variable flow, PSI, temperature, soap, steam capable at the turn of a knob, and ETL certified to UL and CSA standards. These portable gas powered hot water units are built using heavy-duty components and rugged steel chassis to withstand the most rigorous conditions. Their compact frame design and tubed pneumatic wheels provide easy maneuvering in all terrains. Each is ETL certified and comes with a leak-free Schedule 80 heating coil surrounded by a stainless steel wrap. Built on a rugged 1-1/4” powder-coated steel frame, these compact electric roll cage models are designed for construction sites, farms, and factories where electricity is available. These models deliver hot water cleaning of up to 2,000 PSI using 12V or 230V/1ph, and feature a direct-drive crankcase-style pump with a 7-year warranty, industrial-grade Baldor motor and 1/2” Schedule 80 heating coil with stainless steel wrap. Kärcher Series oil-fired skids are the workhorses of the pressure washer industry. 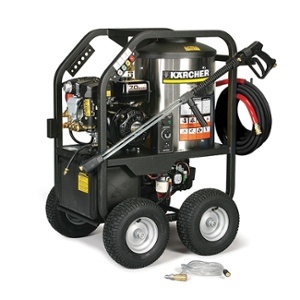 Delivering up to 5.6 GPM of hot water at up to 3,500 PSI, these rugged gas and diesel-powered machines are built on an open frame using heavy-gauge 1-1/4″powder coated steel and are ideal for mounting to a truck or trailer. The electric start engine and powerful belt drive Kärcher KI pump are isolated from the rest of the machine on a shock-mounted sub-frame to reduce vibration. A steam combination comes standard on all models.